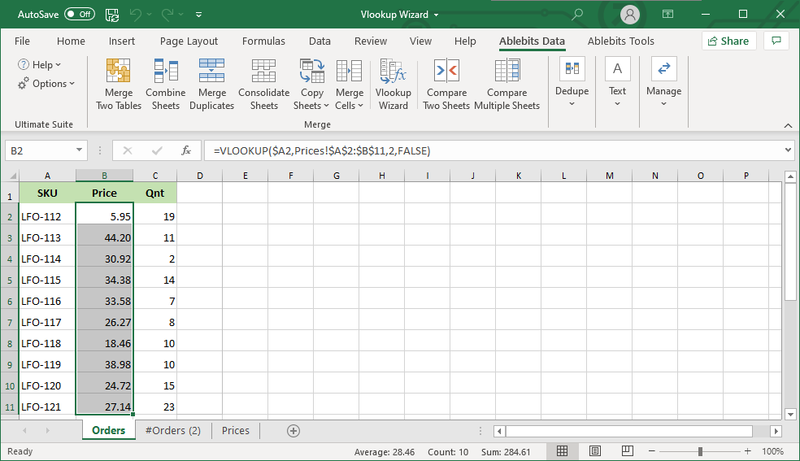 Get Vlookup formulas written quickly and painlessly, without having to learn the syntax and numerous specificities of the Excel VLOOKUP function. An intuitive wizard will guide you through the formula building process and help you define the arguments. As the result, you get a formula that is the best fit for your particular data. 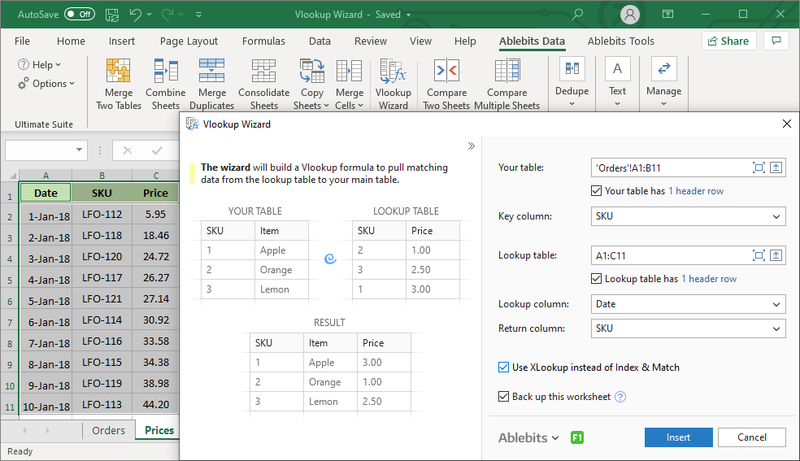 Excel VLOOKUP made easy The interactive wizard will walk you through the configuration options to make a Vlookup formula based on your criteria. Custom-tailored VLOOKUP formulas Just specify the key column to search for, the column to look up against and the column to retrieve the values from, and get a flawless formula best suited for your dataset. Left lookup is not a problem Excel VLOOKUP cannot look to its left. Our wizard can search in any column with a more powerful INDEX MATCH combination. Safely copy or move your VLOOKUP formula Due to the clever use of relative and absolute cells references, you can copy your Vlookup formulas to any column, without worrying about updating the references. What is VLOOKUP Wizard and what do I need it for? Excel VLOOKUP Wizard is a one-step utility to pull matching values from another table located in the same or different Excel worksheet or workbook. You just select your main and lookup tables, specify the lookup and return columns, and have an impeccable Vlookup formula inserted in your worksheet with no additional efforts. 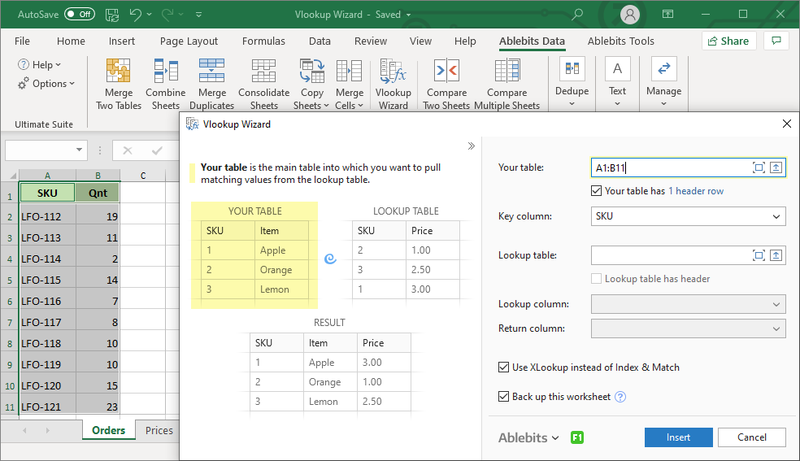 What is the difference between VLOOKUP Wizard and the native Excel function? VLOOKUP Wizard does not use any custom functions, only native ones. Depending on which columns you select for the arguments, the wizard chooses the function most appropriate for your particular data. Thus, you get a robust Vlookup or Index/Match formula and learn some valuable tips about the formula syntax along the way. Win-win! How to do a VLOOKUP using the wizard? Your table – your main table into which you want to pull relevant data (in most cases it's selected automatically). Key column – the values to search for. Lookup table – the table where you look up information. Lookup column – the column to look up against. 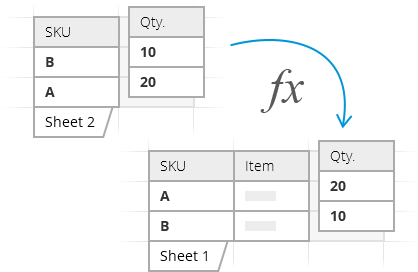 Return column – the column from which you retrieve values. Once the argument boxes are filled in, click the Insert button. Optionally, select the Back up the worksheet checkbox (recommended for the first use of the wizard). 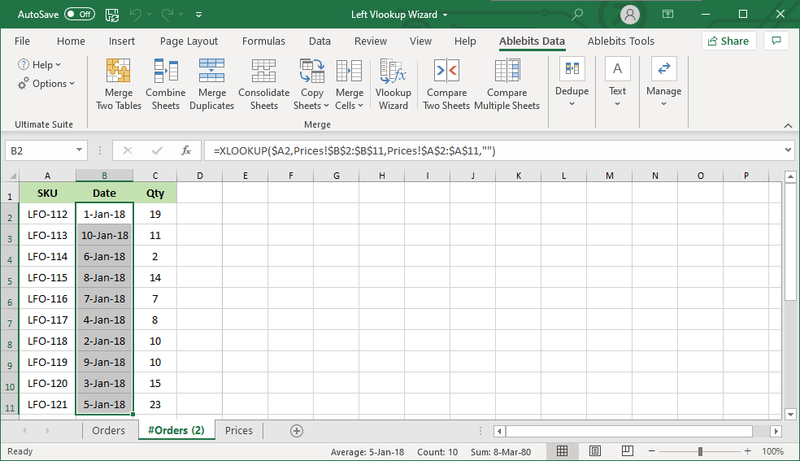 A new column with Vlookup formulas is inserted next to your key column, saving you the trouble of copying the formula manually. Can the wizard recognize my columns by headers? Yes. If your columns have headers, just tick off My table has headers checkbox, and you will be able to select the columns by their headers. Can I do a left lookup with this tool? Yes. 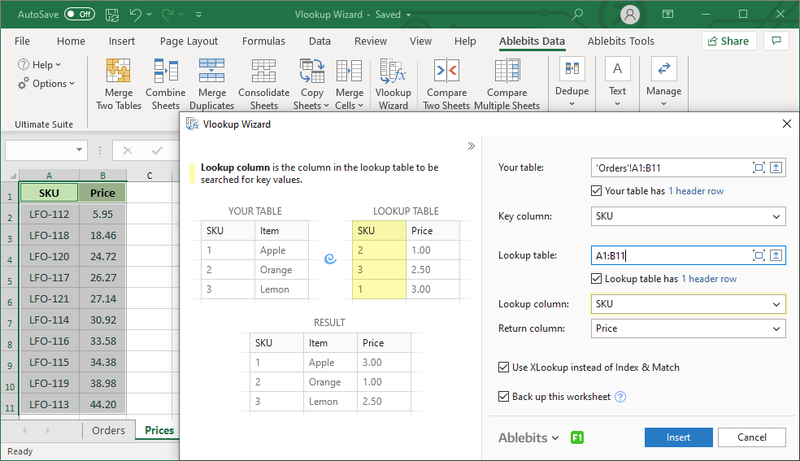 Our VLOOKUP Wizard for Excel doesn't care where your lookup column is located. In situations when you need to vlookup to the left, an Index/Match formula is inserted, which can search anywhere. Does VLOOKUP Wizard treat uppercase and lowercase differently? No. Like all regular Vlookup formulas, the formulas built by the wizard are case-insensitive. Do I have to sort the lookup column for the formulas to work correctly? No. Sorting the lookup column in ascending order is only required for Vlookup with approximate match. Our wizard always makes Vlookup formulas with exact match (FALSE in the range_lookup argument), which do not require sorting the lookup column.